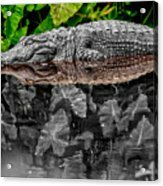 Let Sleeping Gators Lie - Mod iphone x case by Christopher Holmes. Protect your iPhone X with an impact-resistant, slim-profile, hard-shell case. The image is printed directly onto the case and wrapped around the edges for a beautiful presentation. Simply snap the case onto your iPhone X for instant protection and direct access to all of the phone's features! Well named, great shot Christopher! I love the reflections and two-toned ness of this! Very nice work! 20080301-DSC3093-2 This is a modificaton of my original "Let Sleeping Gators Lie" image. I just wanted to play with mixing tones.